Photo: ARCHIE Foundation PR Media. Sam Cox, known by fans as Mr Doodle, is an English artist with a self-confessed obsession with doodling. The young talent’s love of drawing from an early age has lead him to become a massive internet sensation with an impressive star-studded backing. Mr Doodle has a whopping 1.9 million Instagram followers, including the likes of celebrities Chloe Grace Moretz and Drake Bale, who have a combined following of over 18 million. Mr Doodle, who even created his own doodled Universe appropriately named ‘DoodleLand’, is set to pay a visit to our wee city, and for a very special reason too. The artist will be at Dundee Railway Station this Sunday to draw his trademark black and swirly designs onto one of our much-loved Oor Wullie statues. The statue will form part of this summer’s Oor Wullie’s BIG Bucket Trail, which raises funds for The ARCHIE Foundation. I am excited to be a part of this project. I love doodling over everything and to doodle over such an iconic Scottish character will be an honour and a lot of fun too. 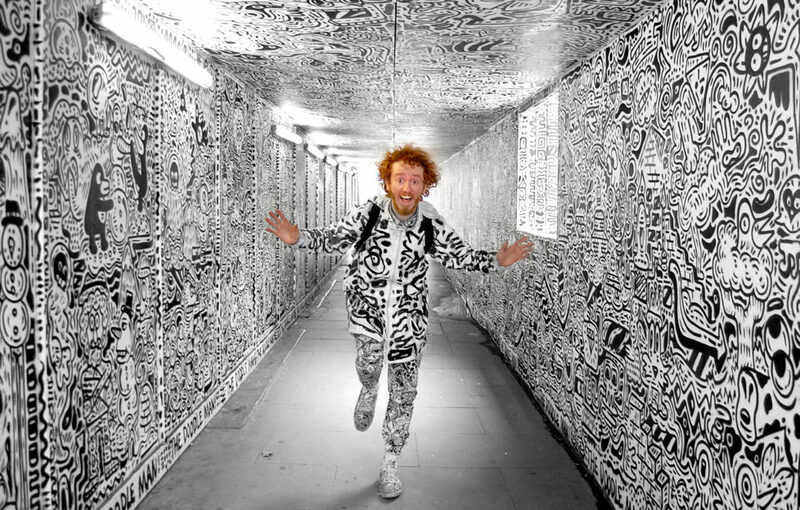 I’ve drawn on lots of walls, furniture and vehicles but nothing quite like this, so it will be exciting to see how Wullie looks covered in doodles! Renowned for his thick, black patterns and unique shapes, Mr Doodle certainly has an illustrious set of clients. He’s worked with the likes of MTV, Adidas, Samsung, and Cass Art, and has travelled across the globe with his work, creating art across America, Japan, and Mexico. Mr. Doodle’s day of dedicated doodling kicks off at 10am, and is expected to take up to eight hours to complete.